California has something called "cultural lead" and often starts trends which spread across the rest of the country. This also happens in housing trends and is exhibited in the finest California luxury homes. Some of these trends represent the future of residential architecture. Click on the following related article links and learn more about California's trends below. One such trend is adding a "patina" to get an aged appearance on exterior and interior finishes and surfaces. This is just one example of the lengths to which builders of luxury and custom homes will go to please picky clients.The interest in luxury homes means those wealthy enough to afford the newest in home design are often the tastemakers and harbingers of future housing trends. Specialty rooms are popular. Basketball courts and gyms are being built, and wine cellars are moving up to the ground floor level. Some people want massage rooms to relax from their high-stress lives. Master baths are big enough for a lounge or seating. People are looking for non-traditional spaces, such as yoga studios and exercise spas, they want more than just traditional workout machines. Some homes have two family rooms, two or three laundries, two exercise areas -one for the kids, one for the adults. Also, many have two offices - usually mom's is off the kitchen. One item that appears to be diminishing in popularity is the vaulted two-story ceiling. People want the floor space. Elevators are growing in popularity, and not just for older couples. Elevators are becoming standard in luxury homes. They even are being built into townhouses, (even though prices for an elevator begin at $15,000 to $20,000). Outdoor space is hot - including pools, fire pits, barbecues. 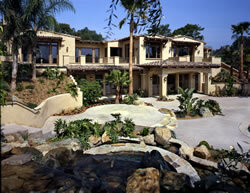 Outdoor living is important, and especially attractive in Southern California. Shallow-depth wading pools are popular and rectangular pools are coming back because of the need for safety covers that only are made in rectangular sizes. There is resurgence in enclosed porches and areas which may be opened or closed off to the weather. These days some people want to make them year-around rooms and put in fireplaces. Homes are often designed to take advantage of whatever views are available based on the specific site. Custom buyers have embraced home theaters and plasma televisions. Home theaters are almost standard. Home walls and floor plans are now designed around plasma TVs and luxury homes have as many as three. Software programming for the whole-house electronic system. One high-tech area that continues to be in demand is home security. A number of custom homes are being outfitted with multiple security cameras that are tied to the TVs. Some buyers are even asking for safe rooms, as an escape from intruders or terrorists as seen in the movie "Panic Room".